UPDATED: Thu., Feb. 7, 2019, 1:57 p.m.
Keith Robine runs the Kootenay Avalanche Courses and offers Avalanche Skills Training 1 and 2 classes. He’s also the co-author of the “Avalanche Skills Training Handbook,” published by Avalanche Canada. AST 1 courses cost about $180 and are held in Rossland, B.C. For more information visit kootenayavalanchecourses.com/. ROSSLAND, B.C. – In a small Canadian classroom eight adults sat on Sunday, eyes closed, as pieces of chocolate slowly melted in their mouths. In a soothing voice well-suited for a yoga class, instructor Keith Robine asked the group to focus on their breath and refrain from eating the chocolate. Try and not think about the past, he said. Don’t fixate on the future. This kind of exercise is not what one would expect from an avalanche skills course. The 5 minutes of quasi-meditation were an attempt at addressing one of the more confounding facts about avalanches. The vast majority of them – around 90 percent – are triggered by the victims themselves. Robine has been teaching avalanche education courses for nearly 30 years. In that time, he’s seen the gear that skiers and snowboarders use change dramatically. He’s seen the science of avalanches evolve and climate change make milder winters and less stable snowpacks. Yet one thing hasn’t changed. The human mind. “We’re still, I think, grasping for what is effective and what can we do to impact people’s decision-making so they consistently make better decisions, and hopefully avoid the mistakes that result in fatalities,” he said. Robine’s perspective on the issue comes from his other job: He’s a mental health clinician in schools throughout British Columbia. He sees a wide range of issues, including eating disorders, anxiety, depression and suicidal ideation. His main goal when working with children is to improve their mental wellness. Kids who are highly focused on sports or video games find joy in those moments of single-minded attention. The past disappears, as does the future. That moment, balanced between the history of the past and the potential of the future, is a space Robine hopes his avalanche students learn to cultivate. It could mean the difference between life and death. In most avalanche accidents, there were missed warning signs. In some cases, that’s changing weather, or snow conditions that don’t precisely match the report. People who aren’t paying attention to the present moment often miss Mother Nature’s more subtle warnings, Robine said. This isn’t new in the winter backcountry world. In the early 2000s, Ian McCammon published “Evidence of Heuristic Traps in Recreational Avalanche Accidents” after a good friend of his (and experienced backcountry skier) died in an avalanche. In his study, McCammon examined 700 deadly avalanche accidents between 1972 and 2003. He identified four mental traps into which the victims fell. Known as heuristics, these are mental shortcuts that all humans take while making decisions. This is a valuable tool in normal life, allowing humans to quickly and effectively cycle through complex data. But in a constantly changing environment, like the mountains in the winter, these mental short cuts can be the difference between life and death. Robine identified similar “human factors” in his course over the weekend. The expert halo: in which everybody defers to whoever is seen as the most experienced in the group. Familiarity: Being familiar with the terrain can lead to complacency and riskier decision-making. Competition: Competing against other groups for fresh powder, or against each other, can lead to bad decisions. Commitment to a goal: When the attainment of a certain goal, like a summit, becomes paramount, mistakes can occur. Showing off: Sometimes known as Kodak Courage or Facebook Fame, the desire to impress others, whether it’s in your group or on social media, can negatively influence behavior. Physiological condition: Tiredness, dehydration, hunger and cold can all reduce decision-making. There isn’t one moment in which Robine connected his psychology work with his avalanche education. Instead, it was a slow realization born over years in the backcountry and classroom. He started incorporating some mindfulness work into his avalanche courses about five years ago. At the same time, avalanche education has changed. Beginning avalanche courses focus less on the notoriously tricky science of snow and more on decision-making and group dynamics. Psychologists have documented the beneficial effects of meditation and other mindfulness practices. Research indicates that meditation reduces stress and may help people make more rational decisions – two important outcomes in avalanche terrain. The importance of reacting instantly to a new reality was effectively highlighted Monday. 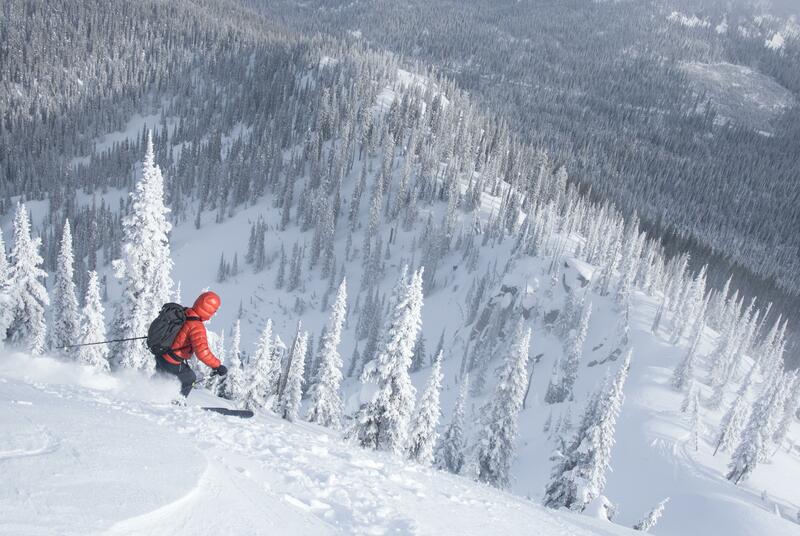 After a day of classroom learning, the eight students in Robine’s course headed to Kootenay Pass to ski tour. Skiing down one snow-blanketed meadow, the students whooped in joy, each turn cushioned by a foot or more of powder. And then, everything changed. Robine, who had skied ahead of the group, called in a mock scenario over the radio. There had been an avalanche. A skier was buried. The group had to switch, on a dime, from the romping fun of a powder day to the deadly serious business of locating and saving a person. Jon and Shana Oellrich came from Sandpoint for the two-day class with Robine. The focus on mindfulness was an unexpected, but welcome, addition to their avalanche education, Jon Oellrich said. Published: Feb. 7, 2019, 6 a.m. Updated: Feb. 7, 2019, 1:57 p.m.